Easy dog cookie recipe ideas. Drop cookie recipes for dogs will make great homemade dog treats. The dog cookies are very flexible in that they can be made in any size to accommodate all dogs from teacups to Great Danes. Because you are making these yourself, you know what a typical “bite size” is for your dog. Drop cookies should be made so that one cookie is the size of one bite. Great homemade dog treats require several ingredients mixed in the correct proportions. Because it is often expensive to purchase several different ingredients when you will only be using a little of each, we have found that if you use a dog treat base mix as a starting point, you will benefit from having all of the different base ingredients in the correct amounts for an economical price. 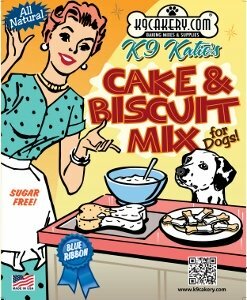 The following dog cookie recipe ideas require use of a homemade dog treats base mix which is available over the internet from companies such as K9Cakery.com. Prepare the dog treat base mix as instructed for this dog cookie recipe. Check the bottom of some of the treats during the cooking process. If they begin to get dark brown around the edges, turn off the oven. These treats can burn on the bottom before you see it on the top. Once cool, store treats in the refrigerator in an air tight container for up to 2 weeks. If you do not plan to use all of them within 2 weeks' time, store the extra treats in the freezer until you plan to use them. Decorate with Magifrost dog treat icing for a shiny, glossy finish. Peel and dice pumpkin into ½ inch squares to fill ½ cup. Place pumpkin cubes into a microwave safe dish and microwave on high until soft and easily mashed. Microwave times will vary based on the power of your oven. A few minutes should be all that is required. Mix the pumpkin, apple sauce and yogurt powder together in a mixing bowl to form the pumpkin mixture. Prepare the dog treats base mix as instructed for this dog cookie recipe. Once the base mix is prepared, add the pumpkin mixture and mix well. Drop spoonfuls of the mixture onto the pre-greased cookie sheet and place on the middle rack of the oven. Once cool, store treats in the refrigerator in an air tight container for up to 2 weeks. If you do not plan to use all of them within 2 weeks' time then store the extra treats in the freezer until you plan to use them. Peel and dice one apple into ½ inch pieces and place in a bowl. Place a pan on the stove at medium heat and coat with cooking oil (we recommend extra virgin olive oil for its health benefits). Add sugar to pan and mix well. Sugar will begin to caramelize over heat. Once sugar begins to caramelize, add diced apple. Stir apple until it is well coated and softens from the heat. Turn off heat and pour apples back into their bowl. Prepare the homemade dog treats base mix as instructed for this dog cookie recipe. .
Drop bite sized drops of the mixture onto the pre-greased cookie sheet and place on the middle rack of the oven. 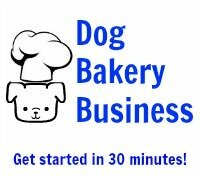 Bake until homemade dog treats are a golden brown and firm to the touch. Smaller treats will take less time than larger treats. When done, turn off oven and let treats remain inside for another 60 minutes to cool and harden. Once cool, store the treats in the refrigerator in an air tight container for up to 2 weeks. If you do not plan to use all of them within 2 weeks' time then store the extra treats in the freezer until you plan to use them (pack well to avoid freezer burn).